The fifth major release of Apple’s mobile operating system, iOS 5, has been in users’ hands for about a month. Now that we’ve all had time to play with the marquee features like Notification Center, let’s dig deeper to reveal more obscure new functionality. It seems like every time Apple releases a new product, there are little gems and nuggets of functionality that don’t become widely known until weeks or even months later. That’s because the heavily marketed features like Notification Center, Siri, and iMessage understandably get all of the attention at first. Having had some quality time with iOS 5 under our belts, let’s look at 9 lesser-known tips and tricks power users might enjoy. When you’re in the Camera app before or after you’ve taken a photo, you don’t have to tap the little thumbnail in the lower corner of the screen to see your pictures. Just swipe anywhere on the screen from left to right and your Camera Roll will instantly slide into view. The Weather app in iOS has always been very basic, which often meant downloading a 3rd party app was necessary to get more detailed information. 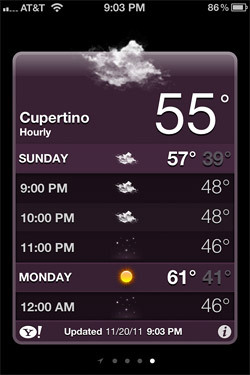 Apple has given the Weather app a nice upgrade in iOS 5 by including hourly forecasts. Just tap on a day of the week and the hourly breakdown will appear. In the past, we’ve had to delete the entire cache and all of Safari’s cookies in order to remove one site’s data from our device. Not anymore! By going to Settings > Safari > Advanced > Website Data you can pick and choose which website’s data should be deleted from your iOS 5 device. Have you ever had to copy something from a previous message in an email chain and then paste it in the message you’re composing? Those “quoted” indentations came along with it and were a hassle to remove. Now you can select the text after you’ve pasted it, tap the arrow pointing to the right, and select the Quote Level option. From there you can decrease or increase the indentation level. It was incredibly frustrating to reply to certain emails in previous versions of iOS because you couldn’t move a recipient between the To, CC, and BCC fields. Deleting and retyping the email address was the only way around it. 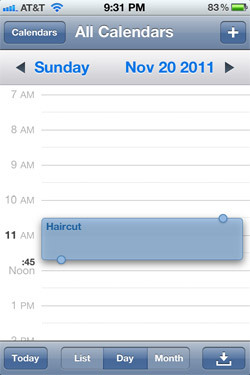 Now, in iOS 5, you can simply tap, hold, and drag recipients between these fields. 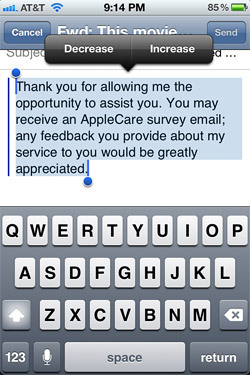 If you type certain phrases or lines of text often, iOS 5 can automate the process with custom keyboard shortcuts. Go to Settings > General > Keyboard > Add New Shortcut. 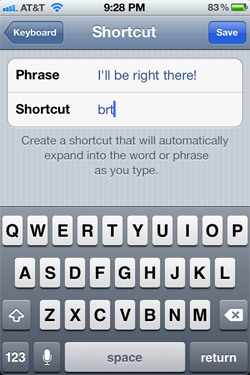 For example, you could enter “I’ll be right there!” as the phrase and “brt” as the shortcut. Anytime you type “brt” in an email, message, note, etc. your phrase will appear. When you’re in Day view in the Calendar app, you don’t have to tap those tiny arrow buttons to switch between days. Just swipe left or right anywhere on the screen to navigate. In Day view, you can edit an existing event without ever going into Edit mode. Tap on an event and hold it until a drop shadow appears underneath. Now try dragging it up and down to change the time of day it occurs, or left and right to switch which day it appears under. You can even drag the dot handles up and down to change the duration of the event. When someone sends you an iMessage and you read it, the other person is notified. If you’re someone who doesn’t like to reveal that kind of information for whatever reason, you don’t have to. By going to Settings > iMessage, you can switch “Send Read Receipts” off. Now the sender won’t know whether you saw their message or not. Sneaky! What are your favorite “obscure” iOS 5 tips & tricks? I upgraded to iOS5 on my iPad2, but can’t find the weather app. Is that just for the iPhone? The Weather app is exclusive to the iPhone. We’ll be publishing another article about iPad-specific iOS 5 features soon, though, so stay tuned!